Fly fishers travel from all over the world to attend the legendary Salmonfly hatch that takes place every year in Western North American rivers. Why do they make such a trek? Why is the hatch legendary? How about great stout nymphs and flying adults almost two inches long driving big trout mad—do you think that might explain it? 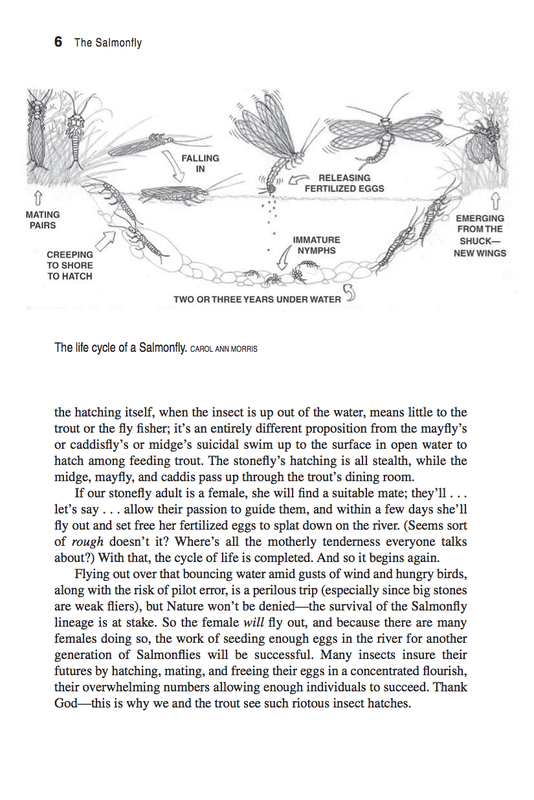 This Salmonfly guide covers the flies, strategies, tackle, timing, and fine-but-critical points that make for success when these amazing insects are all over the river. 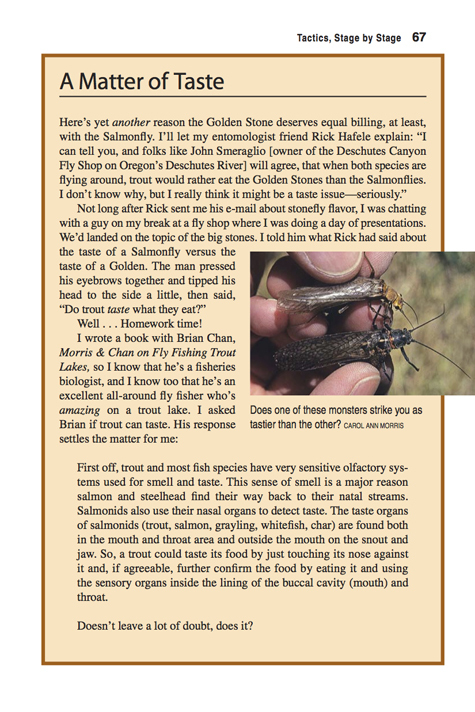 The Salmonfly hatch (and the hatch of another stonefly almost as big) can provide incredible fishing…if you do a number of critical things right (and bring a little luck with you)—it can be a tricky hatch to mine. Fish the hatch without understanding it and you can be in for slow fishing. So unless you’re an old hand at working the Salmonfly hatch (and even if you are, you may find some important insights), you need an edge. 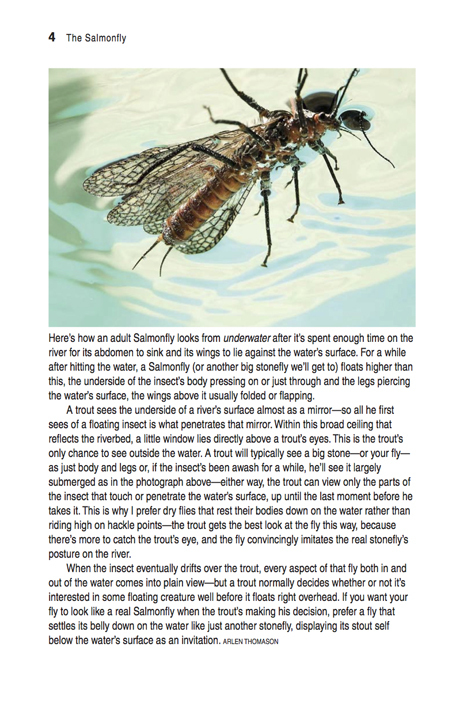 This Salmonfly guide will provide you that edge, and more. “This is my favorite sort of book: small, tightly written around a single important subject, in fine prose, and with photos that are even better. When Salmonfly and Golden Stone nymphs migrate, or adults are on the wing, trout are seldom interested in eating anything else. Skip Morris’s book tells you what to do. He’s done it again—this book is unfair to the trout." 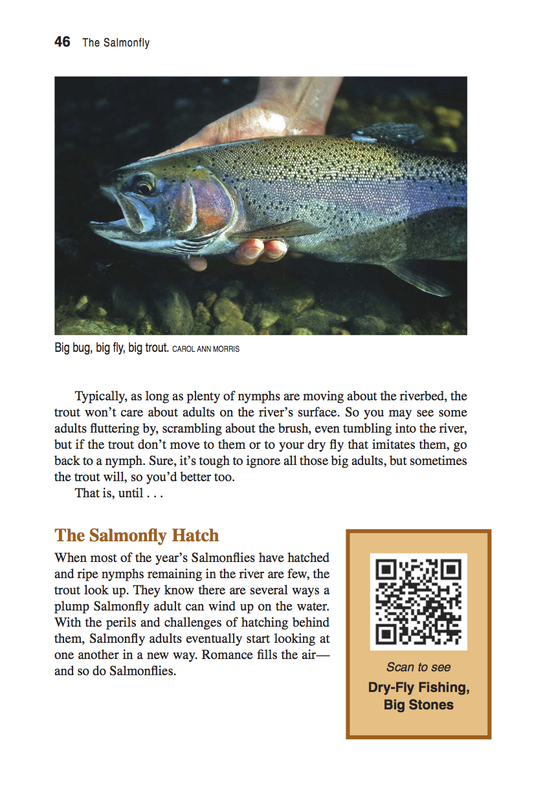 The Salmonfly is loaded with elegant color photographs to clarify important points—such as identifying good holding water for the various stages of the hatch, strategies for presenting flies, and lots of crisp close-ups of the insects as nymphs and winged adults—and some elegant fishing and trout shots just please the eye. Illustrations appear wherever they best express details and ideas—rigs for nymph and dry-fly fishing, the important effects on sun and cloud cover and shade on fishing, effective hook setting with unseen nymphs, and more. The section on flies is extensive—a broad collection of proven, varied, and often fascinating patterns. 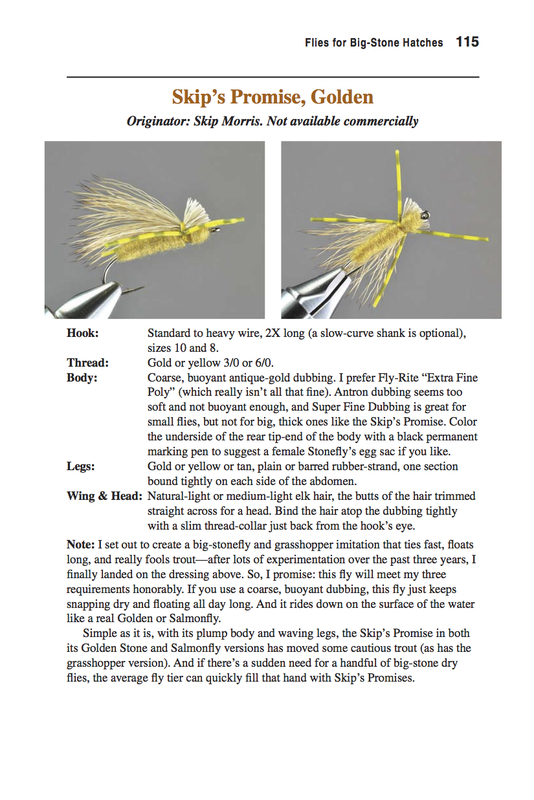 There’s a lot here for the fly buyer to consider before purchasing a collection, and enough fresh and fascinating designs to keep the fly tier happily busy at the vise for a long time; the fly dressings are very thorough, with many including tying details. 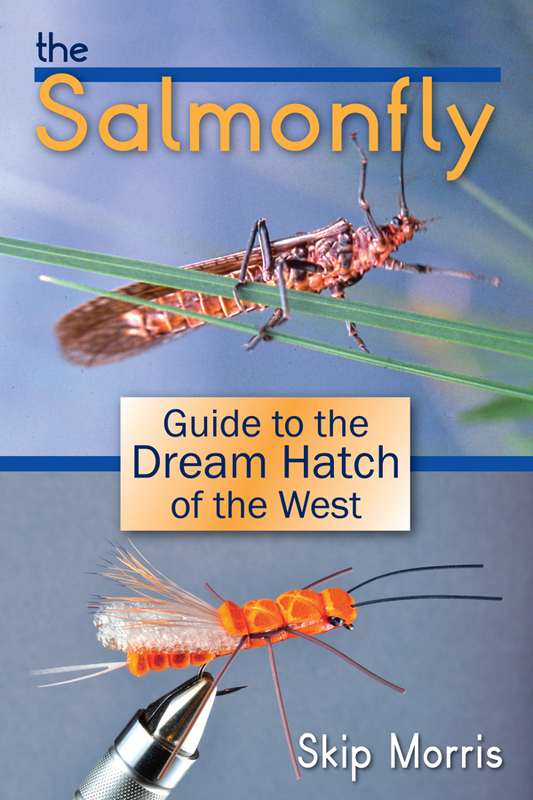 If you’ve fished the Salmonfly hatch only a little, or not at all but would love to, The Salmonfly will prove invaluable to you. It’s such an amazing hatch, you may want to read about it even if you’ve never heard of it before.